This site was a nice change of pace for us at InterCreative - one we were very happy to make. 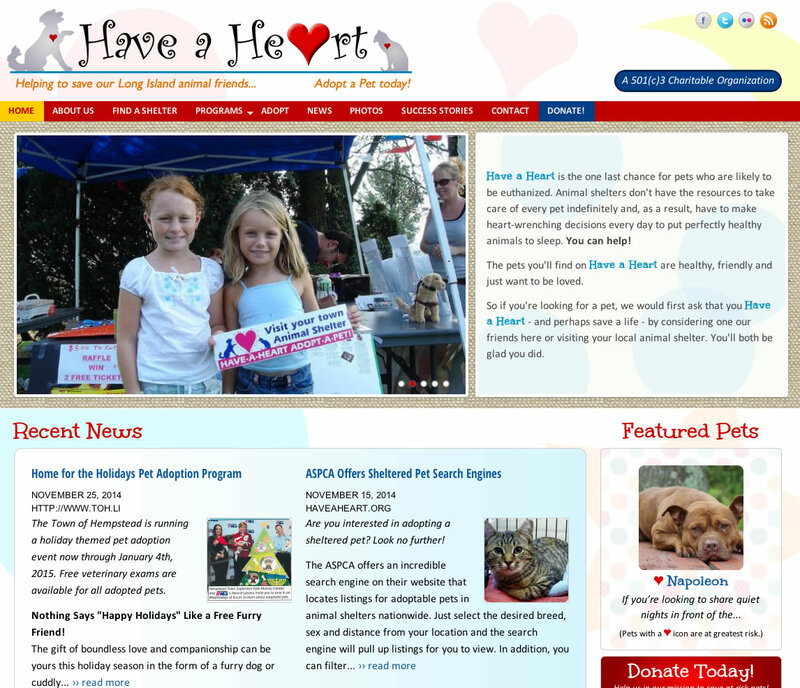 Richard Schefer (and now daughter Aileen) have been very visible on Long Island for years with their HaveaHeart Adopt-a-Pet events, where at-risk pets are connected with new, loving owners. The concept is simple - but it takes a lot to make it work. With the hundreds of adoption agencies and municipal shelters in the Long Island area, the challenge was to provide a comprehensive site that was both easy to update and easy to use. Individual shelters can be searched directly from the Find a Shelter page, which differentiate municipal shelters from rescue groups. (Pets in municipal shelters are at greatest risk being put to sleep.) The Adopt page allows users to search by various criteria and the Success page tells the happy stories on pets who have found new homes. The site is, of course, fully-adaptive to display appropriately on all devices, from mobile, to tablet, to desktop and everything in between. InterCreative was happy to go the last mile in doing all we can to help Have-a-Heart in their worthwhile mission and we wish them continued success!